The city of Topanga is bordered on three sides by State Park or conservancy lands, and by the Pacific Ocean and a small strip of Malibu on the south. When you visit beautiful Topanga, LA Yellow Cab is there to offer you safe and timely cab services! LA Yellow Cab is a reliable transportation cab company that offers you use of our large fleet of vehicles, each driven by a professional, proud and independent cab owner. This team will ensure all of your transportation needs are met, quickly and efficiently. LA Yellow Cab has the largest fleet of taxi cabs in Los Angeles, so be sure to call us when you need a ride. Rather than stressing over traffic and parking, call the friendly taxi cab drivers at LA Yellow Cab. We provide clean and reliable cabs with professional drivers who will get you where you need to go quickly. The name “Topanga” comes from the name given to the area by the Native American indigenous Tongva tribe and means “a place above.” Whether you are with your family, traveling alone or are with a large group, the courteous drivers at LA Yellow Cab can help you get to and from the airport on time. If you are visiting Topanga, we recommended that you take time to enjoy the city’s wide selection of local entertainment venues, restaurants and pubs. Our drivers have a good working relationship with many of the local bars and eateries. If you need a recommendation for a great place to eat or find a drink, the drivers at LA Yellow Cab are happy to help. Whether you are here with your family, your colleagues or are by yourself, LA Yellow Cab can get you anywhere you need to go. LA Yellow Cab also provides timely airport transportation services. Our professional drivers can get you to and from local airports, including LAX or Burbank Airport, quickly and efficiently. 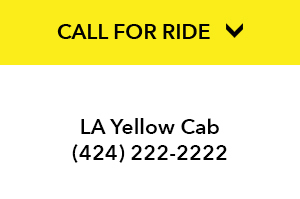 When you choose LA Yellow Cab, our driver will be there on time for pick up or drop off. Your travel stresses and hassles will be forgotten with our friendly and efficient airport transportation services. At LA Yellow Cab we are pleased to offer you taxi cab transportation services. Our team of friendly and courteous drivers will work tirelessly to ensure you enjoy Los Angeles or the surrounding area, getting you where you need to go and even offering suggestions for places you might like. LA Yellow Cab goes beyond giving you a ride. We extend our transportation services to paratransit assistance and aiding those with mobility issues. We also have the resources to transport large groups. Simply contact us via phone, email or text with your transportation needs and we will develop a plan to get you where you need to go. With LA Yellow Cab you have the option to book your ride online, or book via phone or even text. Plan ahead and have a scheduled pickup or simply give us a text or call whenever you need a ride. LA Yellow Cab will provide you with courteous, safe and reliable taxi cab transportation services throughout the entire Los Angeles area.